The Tony Award-winning War Horse will premiere in Vancouver this September with a short one-week run at the Queen Elizabeth Theatre. 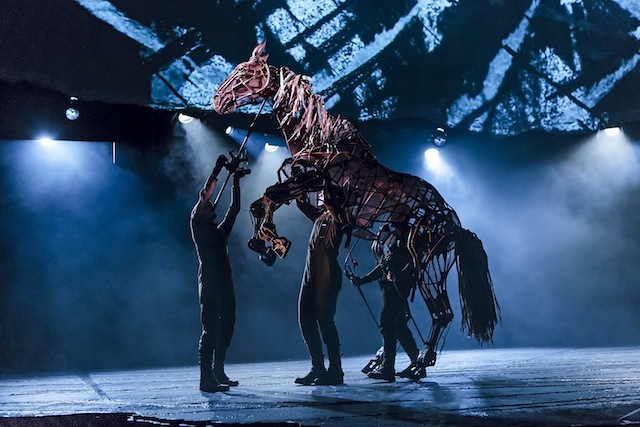 The National Theatre of Great Britain’s epic War Horse is the winner of five 2011 Tony Awards including Best Play and the film of the same name (based on the book by Michael Morpurgo) was nominated for six Academy Awards. England, 1914. As World War One begins, Joey, young Albert’s beloved horse, is sold to the cavalry and shipped from England to France. He’s soon caught up in enemy fire, and fate takes him on an extraordinary journey, serving on both sides before finding himself alone in no man’s land. But Albert cannot forget Joey and, still not old enough to enlist, he embarks on a treacherous mission to find him and bring him home. This powerfully moving and imaginative drama, filled with stirring music and songs, is a show of phenomenal inventiveness that is currently playing to packed houses in London and around the world. At its heart are astonishing life-sized puppets created by South Africa’s Handspring Puppet Company, that bring to life breathing, galloping, charging horses strong enough for men to ride. War Horse will run from September 24th to September 29th, 2013 in Vancouver, Tuesday through Saturday evenings at 8:000pm with Thursday, Saturday and Sunday 2:00pm matinees. Tickets will go on sale on Monday, July 22, 2013 and prices range based on the performance and seat location but they start at $35 plus fees and applicable taxes. I have a pre-sale code valid now until Sunday, July 21, 2013. Go to this ticket link and once you select your date, you will be prompted to enter a code where it says “Got An Offer Code?”. There you will enter: BILLY. You will then have access to the pre-sale until Sunday night. War Horse in Vancouver, presented by Broadway Across Canada, is part of a four city tour in Canada including dates in Calgary September 10 – 15, 2013; Edmonton September 17-22, 2013 and Ottawa January 21 – 26, 2014. Follow Broadway Across Canada on Facebook and Twitter to find out more about their shows and productions they will be bringing to Vancouver stages.